Keith Allan Kramer, composer, currently resides in Boston, Massachusetts and is an Assistant Professor at Central Connecticut State University. His compositions are performed frequently throughout the U.S. as well as internationally. He has studied composition with Thomas DeLio, John Van der Slice and Stuart Saunders Smith. Keith received his D.M.A. in composition from the University of Miami and his M.Mus. in composition from the University of Maryland, College Park. 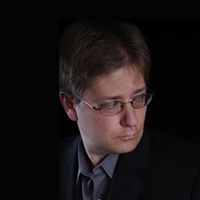 Keith was the President of the Baltimore Composers Forum from 2008-2010 and currently serves on the board of directors. Recent performances of his work included highly successful all-Kramer programs in New York’s Merkin Hall in 2006 and 2010. His music has been performed and recorded by the Slovak National Symphony Orchestra, conducted by Kirk Trevor, the Moravian Philharmonic Orchestra conducted by Vit Micka, University of Miami Symphony Orchestra, conducted by David Stockton, David Taylor, Gottfried Stoger, David LaVorgna, Jessica Hanel Satava, Joseph Satava, Azimuth Quartet, Mariner String Quartet, Pictures on Silence, Jacqueline Pollauf, Noah Getz, The Capitol Hill Chamber Players, Jade Strings, Sonora Ensemble, Alan Ngim, George Weremchuk, Hye-Jung Hong, Jeremiah Baker, Megan Ihnen, Andrew Stewart, Jason Buckwalter and Maiko Suzuki. Keith has collaborated with choreographers Lynne Price, Sonia Synkowski and Lauen Withhart, as well as visual artist Fred Merrill. Keith’s releases include the exciting new double CD set on the Navona label entitled Emerge, featuring over two hours of never-before released music and enhanced content featuring complete scores, concert footage and biographies of the performers featured in the recordings. The title track of Emerge is a twenty-minute orchestral work that is also heard on the Navona release Mementos. It is available at numerous fine music distributors including Amazon, Arkiv Music, CD Universe and iTunes. The title track of Emerge is a twenty-minute orchestral work that is also heard on the Navona release Mementos. Mementos is available at Amazon, iTunes and many other fine distributors. Keith’s second release on Navona is Causal Dualism, featuring performers such as the Moravian Philharmonic Orchestra and David Taylor. An all-Kramer concert, Beyond Sonic Boundaries Live! 2010, filmed in New York, is a recent Chen Li Music release, and is available from Amazon and CD Baby.